​ I relied heavily on primary sources; see Enhanced End Notes for a discussion. This bibliography includes secondary sources and published primary sources. Amsterdam, Susan. “The National Women’s Trade Union League.” Social Service Review, June 1982. Baker, Jean, ed. Votes for Women: The Struggle for Suffrage Revisited. Oxford, UK: Oxford University Press, 2002. Barnes, Gilbert H., and Dwight L. Dumond, eds. Letters of Theodore Dwight Weld, Angelina Grimke Weld, and Sarah Grimke. Vols. 1 and 2. Gloucester, MA: American Historical Association, 1934. Baum, Dale. The Civil War Party System: The Case of Massachusetts, 1848–1876. Chapel Hill: University of North Carolina Press, 1984. Behn, Beth. “Woodrow Wilson’s Conversion Experience: The President, the Woman Suffrage Movement, and the Extent of Executive Influence.” PhD diss., University of Massachusetts–Amherst, 2004. Blair, Karen J. The Clubwoman as Feminist: True Womanhood Redefined, 1868–1914. New York: Holmes & Meier, 1980. Bordin, Ruth. Frances Willard. Chapel Hill: University of North Carolina Press, 1986. ———. Woman and Temperance: The Quest for Power and Liberty, 1873–1900. New Brunswick, NJ: Rutgers University Press, 1990. Brown, Richard D., and Jack Tager. Massachusetts: A Concise History. Amherst: University of Massachusetts Press, 2000. Chambers, Lee V. The Weston Sisters: An American Abolitionist Family. Chapel Hill: University of North Carolina Press, 2015. Cooney, Robert P.J., Jr. Winning the Vote: The Triumph of the American Woman Suffrage Movement. Santa Cruz, CA: American Graphic Press, 2005. Cott, Nancy F. “Historical Perspectives: The Equal Rights Amendment Conflict in the 1920s.” In Conflicts in Feminism, edited by Marianne Hirsch and Evelyn Fox Keller. New York: Routledge, 1990. Cumbler, John T. From Abolitionism to Equal Rights for All. Philadelphia: University of Pennsylvania Press, 2008. Danker, Anita C. “Grassroots Suffragists: Josephine Collins and Louise Mayo, A Study in Contrasts.” New England Journal of History (Spring 2011). DuBois, Ellen Carol. Woman Suffrage and Women’s Rights. New York: New York University Press, 1998. Flexner, Eleanor, and Ellen Fitzpatrick. Century of Struggle: The Woman’s Rights Movement in the United States. 2nd ed. Cambridge, MA: Harvard University Press, 1975. Fowler, Robert Booth. Carrie Catt: Feminist Politician. Boston: Northeastern University Press, 1986. Franzen, Trisha. Anna Howard Shaw: The Work of Woman Suffrage. Chicago: University of Illinois Press, 2014. Giele, Janet Zollinger. Two Paths to Women’s Equality: Temperance, Suffrage, and the Origins of Modern Feminism. New York: Twayne Publishers, 1995. Ginzberg, Lori D. Elizabeth Cady Stanton. New York: Hill and Wang, 2009. ———. Untidy Origins: A Story of Women’s Rights in Antebellum New York. Chapel Hill: University of North Carolina Press, 2005. Gordon, Ann D., and Betty Collier-Thomas, eds. African American Women and the Vote: 1837–1965. Amherst: University of Massachusetts Press, 1997. Graham, Sara Hunter. Woman Suffrage and the New Democracy. New Haven, CT: Yale University Press, 1996. History Committee of the Federation. From the Past to the Future: A History of the Massachusetts State Federation of Women’s Clubs, 1893–1988. Canaan, NH: Phoenix Publishing, 1988. Hoffert, Sylvia D. Alva Vanderbilt Belmont: Unlikely Champion of Women’s Rights. Bloomington: Indiana University Press, 2012. Holden, Teresa Blue. “Earnest Women Can Do Anything: The Public Career of Josephine St. Pierre Ruffin, 1842–1904.” PhD diss., St. Louis University, 2005. Johnson, Joan Marie. “Following the Money: Wealthy Women, Feminism, and the American Suffrage Movement.” Journal of Women’s History 27, no. 4 (2015). ———. Funding Feminism: Monied Women, Philanthropy, and the Woman’s Movement, 1870–1967. Chapel Hill: University of Carolina Press, 2017. Juravich, Tom, William Hartford and James Green. Commonwealth of Toil: Chapters in the History of Massachusetts Workers and Their Unions. Amherst: University of Massachusetts, 1996. Kaufman, Polly Welts. Boston Women and City School Politics, 1872–1905. New York: Garland Publishing, 1994. Kerr, Andrea Moore. Lucy Stone: Speaking Out for Equality. New Brunswick, NJ: Rutgers University Press, 1992. Kenneally, James J. The History of American Catholic Women. New York: Crossroad Publishing, 1990. ———. “I Want to Go to Jail: The Woman’s Party Reception for President Wilson in Boston.” Historical Journal of Massachusetts (Winter 2017). ———. Women and American Trade Unions. Montreal: Eden Press, 1981. Keyssar, Alexander. The Right to Vote: The Contested History of Democracy in the United States. New York: Basic Books, 2000. Klapper, Melissa R. Ballots, Babies, and Banners of Peace: American Jewish Women’s Activism, 1890–1940. New York: New York University Press, 2013. Kraditor, Aileen S. The Ideas of the Woman Suffrage Movement, 189 –1920. 2nd ed. New York: W.W. Norton, 1981. Kuzmack, Linda Gordon. Woman’s Cause: The Jewish Woman’s Movement in England and the United States, 1881–1933. Columbus: Ohio State University Press, 1990. Lerner, Gerda. The Grimke Sisters from South Carolina: Pioneers for Women’s Rights and Abolition. Chapel Hill: University of North Carolina Press, 2004. Lunardini, Christine. Alice Paul: Equality for Women. Boulder, CO: Westview Press, 2013. Marilley, Suzanne M. Woman Suffrage and the Origins of Liberal Feminism in the United States. Cambridge, MA: Harvard University Press, 1996. Marshall, Megan. Margaret Fuller: A New American Life. Boston: Houghton Mifflin Harcourt, 2013. Marzzacco, Patricia. “The Obligation of Opportunity: Maud Wood Park, the College Equal Suffrage League, and the Response of Women Students in Massachusetts Colleges, 1900–1920.” PhD diss., Harvard Graduate School of Education, 2003. Matthews, Jean. The Rise of the New Woman, 1875–1930. Chicago: Ivan R. Dee, 2003. McCammon, Holly J. “Out of the Parlors and into the Streets: The Changing Tactical Repertoire of the U.S. Women’s Suffrage Movement.” Social Forces 787 (2003). McClymer, John F. This High and Holy Moment: The First National Woman’s Rights Convention, Worcester, 1850. New York: Harcourt Brace College Publishers, 1999. McMillen, Sally G. Lucy Stone: An Unapologetic Life. Oxford, UK: Oxford University Press, 2015. Merk, Lois Bannister. “Boston’s Historic Public School Crisis.” New England Quarterly (June 1958). ———. “Massachusetts and the Woman Suffrage Movement.” PhD diss., Radcliffe College, 1961. Million, Joelle. Woman’s Voice, Woman’s Place: Lucy Stone and the Birth of the Woman’s Rights Movement. New York: Praeger, 2003. Murdock, Catherine Gilbert. Domesticating Drink: Women, Men, and Alcohol in America 1870–1940. Baltimore, MD: John Hopkins University Press, 1998. Norwood, Stephen H. Labor’s Flaming Youth: Telephone Operators and Worker Militancy, 1878–1923. Chicago: University of Illinois Press, 1990. Painter, Nell Irvin. Sojourner Truth: A Life, A Symbol. New York: W.W. Norton, 1996. Porter, Susan L., ed. Women of the Commonwealth: Work, Family, and Social Change in Nineteenth-Century Massachusetts. Amherst: University of Massachusetts Press, 1996. Scharff, Virginia. Taking the Wheel: Women and the Coming of the Motor Age. New York: Free Press, 1991. Schneider, Mark R. Boston Confronts Jim Crow, 1890–1920. Boston: Northeastern University Press, 1997. Smith, Mary Jane. “The Fight to Protect Race and Regional Identity within the General Federation of Women’s Clubs, 1895–1902.” Georgia Historical Quarterly (Winter 2010). Solomon, Martha, ed. A Voice of Their Own: The Woman Suffrage Press, 1840–1910. Tuscaloosa: University of Alabama Press, 1991. Srole, Carole. “A Position that God Has Not Particularly Assigned to Men: The Feminization of Clerical Work, Boston, 1860–1915.” PhD diss., University of California–Los Angeles, 1984. Stevens, Doris, and Carol, O’Hare, ed. Jailed for Freedom: American Women Win the Vote. Troutdale, OR: New Sage Press, 1995. Stevenson, Louise L. “Women Anti-Suffragists in the 1915 Massachusetts Campaign.” New England Quarterly (March 1979). Strom, Sharon Hartman. “Leadership and Tactics in the American Woman Suffrage Movement: A New Perspective from Massachusetts.” Journal of American History (September 1975). ———. Political Woman: Florence Luscomb and the Legacy of Radical Reform. Philadelphia: Temple University Press, 2001. Stuhler, Barbara. For the Public Record: A Documentary History of the League of Women Voters. Westport, CT: Greenwood Press, 2000. Tager, Jack, and John Ifkovic, eds. Massachusetts in the Gilded Age: Selected Essays. Amherst: University of Massachusetts Press, 1985. Terborg-Penn, Rosalyn. African American Women in the Struggle for the Vote, 185 –1920. Indianapolis: Indiana University Press, 1998. Thomas, Edmund B. Jr. “School Suffrage and the Campaign for Women’s Suffrage in Massachusetts, 1879–1920.” Historical Journal of Massachusetts (Winter 1997). Van Voris, Jacqueline. Carrie Chapman Catt: A Public Life. New York: Feminist Press at CUNY, 1987. Ware, Susan. Partner and I: Molly Dewson, Feminism, and New Deal Politics. New Haven, CT: Yale University Press, 1987. Welch, Gaylynn. “Local and National Forces Shaping the American Woman Suffrage Movement, 1870–1890.” PhD diss., SUNY-Binghamton, 2009. Yellin, Jean Fagan. Women & Sisters: The Antislavery Feminists in American Culture. New Haven, CT: Yale University Press, 1989. Zahniser, J.D., and Amelia R. Fry. Alice Paul: Claiming Power. Oxford, UK: Oxford University Press, 2014. 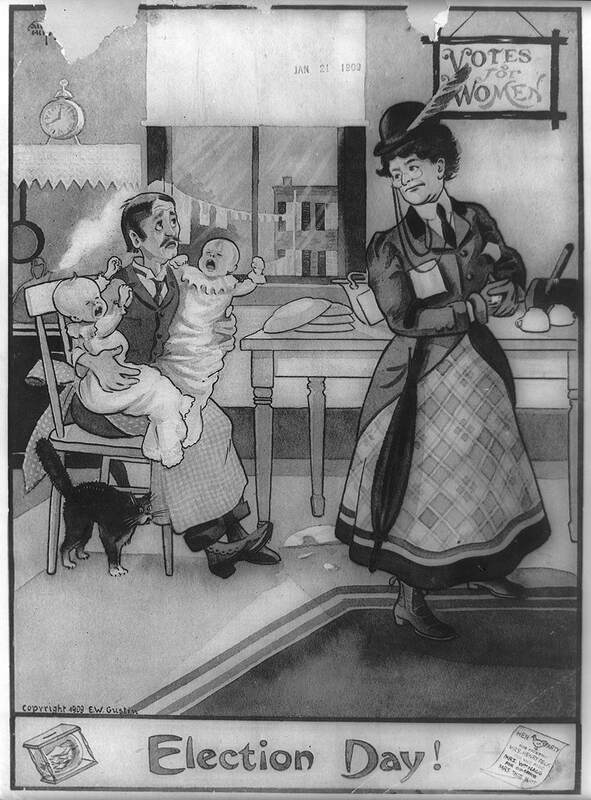 Suffrage opponents claimed that women voters threatened domestic life. Election Day! Courtesy, Library of Congress.